Get that extra special gift with our 12 Deals of HEXMAS limited time bundles! With all these deals, there’s sure to be something for everyone on your list. This bundle includes the remote control BattleBots that have moving weapons and armor that falls off when you take damage. Equip your Gladiator with snap on armor and weapons and try to knock your opponent out of the arena to become champion. Dribble, pass, shoot, and score with the remote controlled soccer robots, and enjoy building the VEX Robotics construction kits with easy snap together pieces. Every Gladiator is in attendance! These autonomous warriors are powered by vibration technology, and enter the arena with various snap on weapons and armor that you can reconfigure. Equip different combinations on your gladiator to perfect your battle strategy and win every fight. Great for family tournaments! The HEXBUG nano Nitro is a micro robotic creature that uses vibration technology to crawl around like a realistic bug. They can climb vertically up tubes and all over the elevation habitat. With extra snap together track pieces, you can create the ultimate habitat for your nano to explore. The mouse and nano cat toys are powered by vibration technology, and scamper and scurry around in a realistic way that is irresistible for felines. Watch as they chase and bat these toys around as the extra batteries provide hours of fun. You can get in on the playtime with the remote controlled mouse toy which lets you lead your pet on a merry chase! These construction kits offer ways for kids to use their imaginations to explore other worlds as they use the snap together pieces to build each vehicle and set. Complete your VEX Explorers collection with this bundle, which is the perfect gift for the growing space explorer. Put your building skills to the test with the VEX Snap Shot and VEX Zip Flyer, which can send projectiles flying over thirty feet! You can also build a miniature version of Minotaur from BattleBots that has a working drum spinner. Assemble your VEX Balancing Boxer and connect with the app to fight using motion controls, so when you throw a punch your robot does also. Knock your friends out and claim victory! Looking for that last Holiday deal to stuff those stockings with? Look no further! With something for everyone, get a bundle the whole family will love. Watch the AquaBots swim around, and let the nano loose to see them scurry. Fill in the empty spaces on your kid’s wishlist with this deal! The vibration powered bug like creatures are back! With all three nano Space sets in one bundle, you can build an epic space station for your nano to crawl around and explore. Put a smile on your little astronaut this season, as they Travel in style on the Zip Line, scan for communications with the discovery station, and control their nano Space headquarters with the Cosmic Command. Give the gift of BattleBots this holiday season! Fight three different ways with the remote control, clutch and clash, or push strike toys, and never let the robot battles stop. Expand your BattleBots collection and battle how you want to. With the ability to customize your own bot with the Build Your Own Bot kit, this truly is the ultimate bundle for any BattleBots enthusiast! Enter the mind of a BattleBots engineer by building your own BattleBot. Choose its armor and type of weapon, and see how your strategy holds up against the heroes of the show. With a realistic Arena set featuring working hammers and all of the latest BattleBots, now is the time to see if you have what it takes to become the next BattleBots champion! 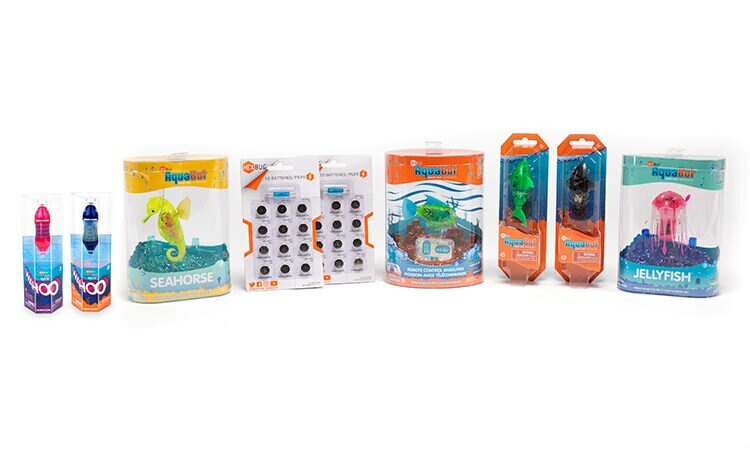 This AquaBot bundle is ready to make a splash! Let the Wahoo, Seahorse, and Jellyfish swim on their own, while you control the depth and direction of the angelfish with the remote control. Get ready to heat up this Holiday season as you relive the summer fun! With two Battle Spiders and two Battle Tarantula, up to four remote control motorized bots can enter the Battle Ground! Fight your opponent for strategic control of the walls. Flip them for points and defensive positions from the laser tower whose gaze sweeps across the Battle Ground and attacks any fighter it sees. The last bot standing with the most walls up wins the fight! For all order inquiries, please contact the HEXBUG Support Team at info@hexbug.com. Allow two business days for initial reply. In the month of December HEXBUG will have 12 exclusive deals available for purchase. Bundles are subject to change depending on stock availability. Promotions are valid December 1, 2018 through December 20, 2018 unless otherwise stated. Pricing, promotions, and availability valid while supplies last. Descriptive, typographic and photographic errors are subject to correction and HEXBUG has no liability for such errors. Bundles must be returned in full to receive a refund. **For orders shipping to outside of the contiguous 48 US, HEXBUG cannot guarantee delivery date. HEXBUG is not responsible for delays due to carrier, weather, road hazard or natural disasters. To guarantee ground shipment delivery by 12/24/2018, orders being shipped via FedEx Ground must be placed by 11:59 PM Central Time on or before 12/16/2018.